The sixth week of our inaugural banding season began with a stinker of a surprise at the nets and ended with one huge surprise in the nets. September 20, while opening the nets, we came around the corner to discover a skunk had taken up residence under the boardwalk we built at Net 4. Surprisingly, it didn’t appear too frightened by our presence and instead appeared to be generally curious as it cautiously approached us. We knew that we would definitely need to keep an eye out for our new “friend”! As with the previous day, banding was slow but steady; we banded 60 new birds, 18 species, and had two new FOS (first of season) species, Swainson’s Thrush & Nashville Warbler. The highlight of the day was an incredibly fat adult female American Redstart. As previously discussed, less than 2% of our redstarts banded this season are adults, so the fact that this bird was an adult was already exciting and then the fact that, at 15 grams, she weighed almost twice as much as the average redstart definitely tipped the scales in her favor as the highlight of the day. The ESE winds overnight cut the previous day’s totals in half and on September 21 we banded 30 new birds of 11 species. We spent most of the morning carefully “herding” deer out of the net lanes and trying to discourage the skunk from continuing its residence under Net 4, especially since it started using the boardwalk as a latrine. No new species to report from that day. We did recapture a Northern Waterthrush that had been with us since it was banded over three weeks prior, which other than not gaining weight, appeared to be healthy and not the least bit stressed. On September 22 we caught our first raptor of the year, a very feisty male Sharp-shinned Hawk. His attitude was bigger than he was as was evidenced by comparing him to the young Northern Mockingbird in the net with him, both of which take the same sized band. With passerines, we often blow on an area of the breast called the furcular hollow to see how much fat that individual is storing, with fat being a good indicator of things such as general health of the bird, habitat usage, etc. Raptors store their fat elsewhere so, we measure things such as the keel of the bird, we take note if the crop is full (which would indicate that the bird recently ate), and, depending on species, we check for fat in the wing pits. The young male Sharp-shinned hawk had nice mass on its keel as well as a full crop and its weight reflected that. Overall for the day, we processed 31 birds (26 new) of 10 individuals. There was no banding on the 23rdor 24thas it rained for almost two days continuously. We opened again on September 25 with 62 new birds banded of 15 species. Interestingly, we only had one recapture that day, hinting that perhaps many of our previously banded birds, particularly the Northern Waterthrush that we had been recapturing continuously for upwards of two weeks, had finally departed south. Another interesting highlight was that almost 30% of the birds banded that morning were adult male Common Yellowthroats, all showing significant fat! Perhaps they were migrating together and/or perhaps they had been bottled up a little further north and the storms pushed them towards us. The habitat at the Meadows is great for them; so, it’s not much of a surprise that they would stopover here. Of course, we wondered how long they would stay, would they stay as long as the Northern Waterthrush, a species that occupies similar habitat? We hoped that our recaptures over the next few days might begin to answer that question. We also banded our first Cooper’s Hawk as well as Blackpoll Warblers of the season. September 26thwill undoubtedly go down in the books as the day that we banded a Yellow-green Vireo. This is a species that breeds from Northern Mexico down into southern Central America, and typically winters in western South America. They are known to be vagrants in the southern US, with very few records north of Florida on the east coast. Interestingly, the other two records on the east coast were also both from banding stations. We knew we had something special when we saw the bird in the net but, I don’t think we realized exactly how special. Not only was this the first state record for New Jersey, it is also the first bird that we placed a transmitter on this season. As you all may recall, our banding project is a collaboration between New Jersey Audubon’s Cape May Bird Observatory, The Nature Conservancy, and Cellular Tracking Technologies (CTT). We were ecstatic that the head of CTT was able to get the head of the Bird Banding Lab (BBL) on the phone and secure permission for us to place a transmitter on this bird, especially as the bird appeared to be in great health with a decent weight and fat score. We hope that by placing the transmitter on the bird, that we can learn more about what it might be doing up in this area and if (and where) it is finding suitable habitat and food sources. 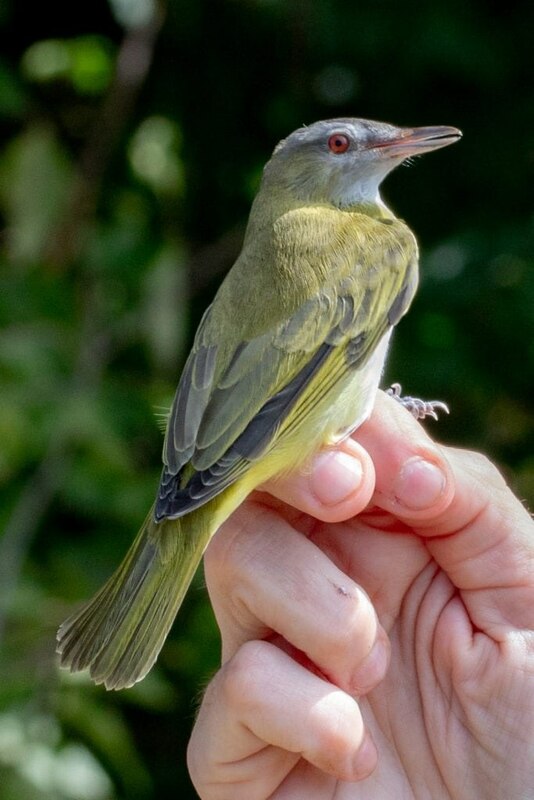 Besides the excitement of the Yellow-green Vireo, we also banded four other FOS species including: Swamp Sparrow, Gray-cheeked Thrush, Philadelphia Vireo, and Blue Jay. We processed 106 birds overall (97 new) of 25 species. Once again, we had an amazing week! Overall, we banded 275 new birds of 37 species. Even though we were unable to operate for two days due to the weather, we still had a total of 512.5 net hours. Interestingly this week, 16.73% of the birds banded were adult (AHY) birds. This increase is most likely due to the influx of adult Common Yellowthroats into the marsh. Northern Waterthrush regained the lead (most likely for the last time) with 64 individuals banded. Gray Catbirds were close behind with 55 individuals banded followed by Common Yellowthroats with 43. Our recapture rates were down with only 25 incidences of recapture, of 23 individuals. You didn’t think we’d get through this post without a photo of the Yellow-green Vireo, did you?